Inserting slides is one of the very basic and most important steps when creating a project. 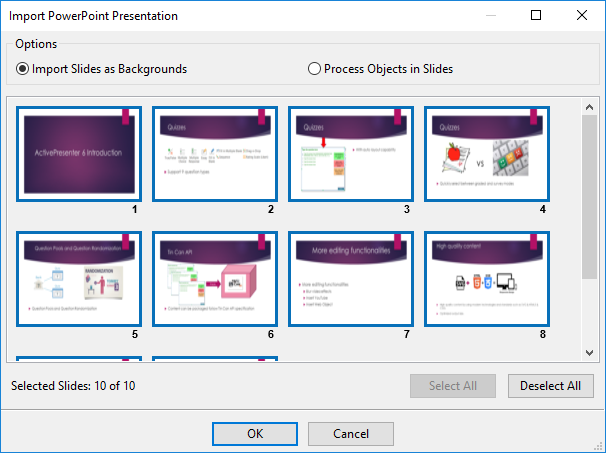 Knowing its importance, ActivePresenter offers many different methods to add slides. You can create a new project with blank slides or add new blank slides to the current project. You can also insert slides from other projects easily. We will learn how to use each method in details through this article. 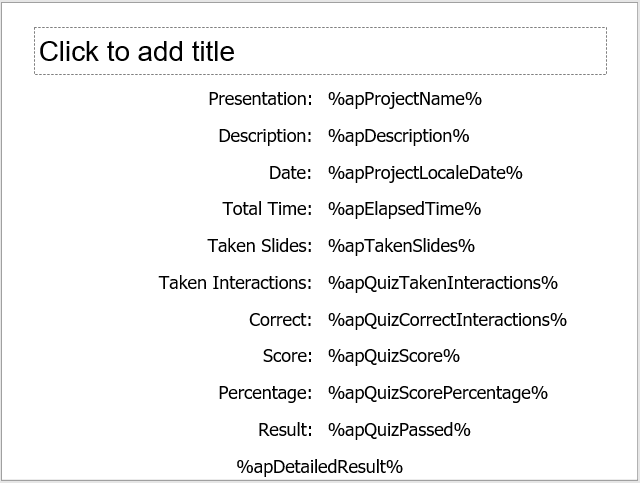 In ActivePresenter, you can create blank projects with blank slides or insert blank slides into the current one. Open the Home tab, click New Slide. Open the Slide tab, click New Slide. To change the slide layout, click Layout in the Home or Slide tab. You can choose one of the built-in layouts or create your own by using Slide Masters. Besides choosing a slide from the gallery in the first method, you can add slides from templates. These new slides based on templates. Note: If you want to know more about how to create and use slide templates, refer to Creating and using slide template. Step 1: Click the Template drop-down button (2) to display the slide templates. You can click the Refresh button to update this list. 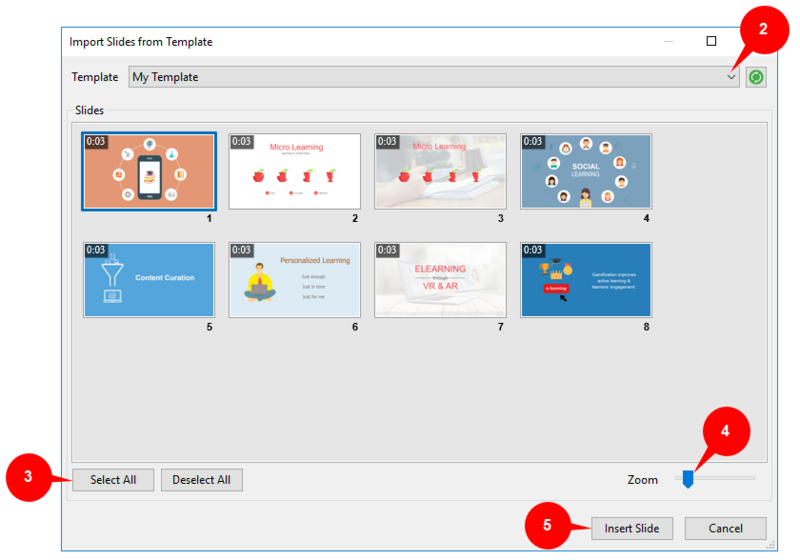 Step 2: After selecting the template you want, all slides in that template are shown in the Slides section. From here, you can choose any slide you want or click Select All (3) to add all of them. You can drag the Zoom slider (4) to zoom in/out slides in the Slides section to view them in larger or smaller size. Step 4: Click Insert Slide (5). Tip: If you have any existing slide templates and want them to be displayed in this dialog, you can copy the slide template file to the C:\Users\UserName\Documents\ActivePresenter Templates folder. This technique is equivalent to Recording Projects, but with the difference that the newly captured slide is inserted in the current project, rather than opening up a new project. Step 1: Open the Home tab. Step 2: Click the Record Screen button (6). Step 3: Select Record Video or Record Software Simulation depending on your purpose. If you have a collection of pictures and want to import them into ActivePresenter as slides, this command is what you need. ActivePresenter supports many image input formats namely BMP, PNG, JPG, JPEG, JPE, GIF, ICO, CUR, ANI, and XPM. Step 1: Click Add Images From File to import images from your file system. Step 2: After adding images, if there is any image that you don’t want to use anymore, click Remove Selected Images to delete it from the left list. Step 3: Click Up or Down to change the order of selected images. This order is also the order of their appearance in the Slides pane. Step 4 (Optional): Click Flip Horizontal or Flip Vertical to flip the image. Click Rotate Right 90 , or Rotate Left 90 to rotate the image. These changes will be applied to its appearance on the Canvas as well. If you select the Use images as objects check box, ActivePresenter will insert each image into a different slide as an object. This means you can edit the image after inserting. Conversely, it will apply each image to the background of the slide by default. Step 5: Click OK to apply the changes and close the dialog. Note: If the size of the imported image is larger than the slide size, ActivePresenter will clip the image automatically. 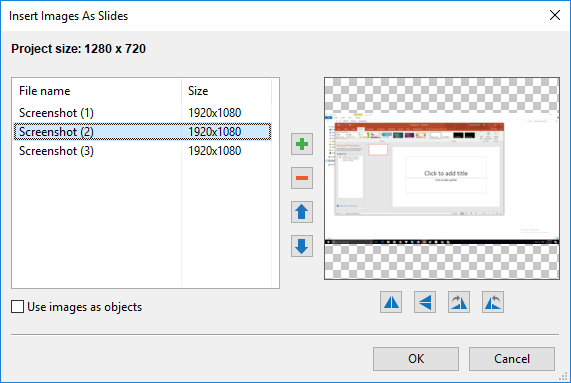 Although after creating image slides you can change the project size if needed, you should bear in mind the image size before importing them. 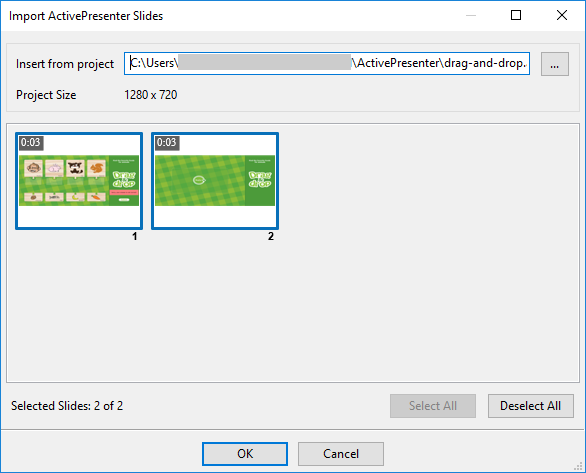 This method is equivalent to Creating projects from PowerPoint slides, but the difference is that each PowerPoint slide is added to the current ActivePresenter project as separate slides, rather than opening up a new project. 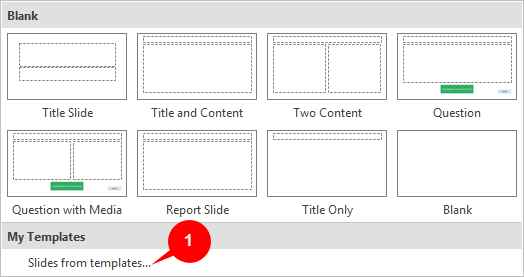 In the Home tab, click Import Slides (7) and select From PowerPoint… (9). In the Slide tab, click Import PowerPoint (12). Import Slides as Backgrounds: Each slide turns into a background image for a corresponding slide in ActivePresenter project. All the separate objects in the PPTX/PPT slides will be flattened into one image, and you cannot manipulate/animate them. Process Objects in Slides: All the objects in each PowerPoint slide are imported into the corresponding ActivePresenter slides. You can manipulate those objects and then annotate the slides in ActivePresenter. Finally, click OK to close the window and start to import. Step 1: In the Home tab, click Import Slides (7). Or, in the Slide tab, click Import ActivePresenter (13). Step 4: Select the slides that you want to import and click OK. Note: ActivePresenter offers a quicker way to insert a slide from other projects: Use the Copy and Paste commands. The procedures and changes are the same as you Copy and paste slides. However, pasted slides and their objects always keep their original sizes and positions. Thus, if the original project (which contains the slides to copy from) and the destination project (slides will be copied to this project) don’t have the same project size, the background may be cropped and some objects may lie outside of the slide. If the original project and the destination one are equal in size, object placement will remain unchanged. Therefore, always check all imported slides and edit them if necessary. See Copy and Paste Slides for more details. Inserting Random Slides is useful in creating test materials (e.g. a project with random questions) to make contents appear unpredictable for learners. This concept in ActivePresenter is exactly similar to the Random Question concept in other tools. Step 1: Open the Slide tab. Step 2: Click Random Slide (14). The slide is automatically linked to the first slide pool in the project. To know more about how to create and use random slides, refer to Creating question pools. Step 2: Click Report Slide (15). A report slide has 11 default parameters. The first 10 parameters consist of a parameter name on the left and a reference to the corresponding variable on the right. Step 3 (Optional): Show/hide the parameters of the report slide. Go to the Interactivity tab in the Properties pane, click Report Display. A check mark next to each parameter indicates that it is visible. To hide a parameter, uncheck the box corresponding to it. Step 1: Select the slide that you want to delete from the Slides pane. Hold CTRL or SHIFT while clicking to select multiple of them. Step 2: Press the DELETE key on your keyboard. Or, you can right-click the selected slides and select Delete from the context menu. So, we’ve gone through all the ways to insert and delete slides in ActivePresenter 7. There are many tutorials about using and managing slides on our tutorial page, feel free to take a look.